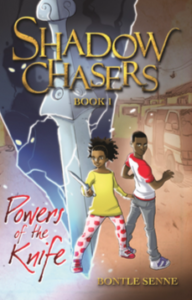 Powers of the Knife is the first book in the Shadow Chasers trilogy. It’s a fantasy adventure ̶ one part family saga, one part hero’s quest. What if you discovered that you come from an ancient family of Shadow Chasers, with a duty to protect others from an evil Army of Shadows? Nom and Zithembe’s lives are turned upside down when an Army of Shadows threatens everyone close to them. It’s the beginning of a quest that takes them into the dream world and will change their lives forever.